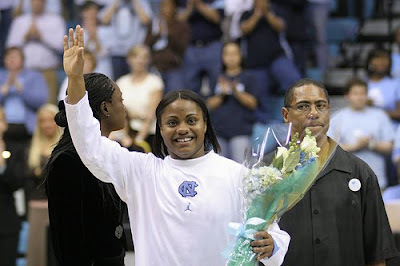 Camille Little and Ivory Latta will be remembered as two of Carolina’s best women’s basketball players. I interviewed them before practice at Carmichael Auditorium in January 2004. Although just freshmen at the time, they didn’t play like it. They see each other every day. After all, they are roommates. They have classes together. They have study hall together. They nap at the same time. They also practice together at Carmichael Auditorium. Meet Ivory Latta and Camille Little, two freshmen on the UNC basketball team who don’t play like it’s their first year in the Atlantic Coast Conference. Latta, a 5-foot-6-inch point guard, and Little, a 6-foot-1-inch forward, have helped the team climb in the national rankings. While they exude confidence, Latta and Little say they never expected to perform as well as they have. 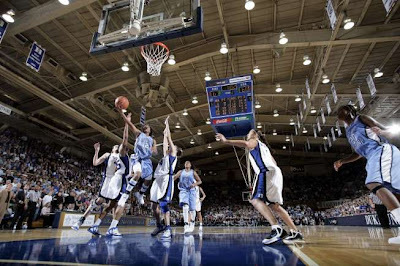 Although they grew up two hours apart – Latta in the small town of McConnells, S.C., and Little in Winston-Salem – before coming to UNC, a similar dedication to the game brought them to this point. The youngest of seven children, Latta “has always been a special child,” says her mother, Chenna, who saw her first dribble a basketball at age 5. Even with asthma, Latta was a hyperactive child. Around the same time she outgrew her asthma at age 7, she began playing organized baseball, which, according to her parents, she played better than basketball. Often, players and coaches from the opposing baseball team didn’t realize the best player they faced was a girl, because Latta wore a hat over her short hair. But her talent and love for basketball was obvious. When she was in fourth grade, Latta's two older sisters played junior varsity basketball at York Comprehensive High School, and Latta came to the practices. Head Coach Arsonia Stroud said Ivory could handle the ball at that time as well as any of the varsity point guards at York. By middle school, Ivory’s game was at a higher level than her peers’, a result of always playing against her older siblings. She also played against older competition AAU basketball, which her father Charles coached from the time she was 11 years old. In seventh grade she scored 40 points in her first game and was soon moved up to varsity, but scoring wasn't the only reason for her promotion. Her mother Chenna had to leave town for several months for her job and Ivory's sister, Iris, was a senior on the York team. The move made it more convenient for Charles to pick up his daughters up after practice. That year, Latta came off the bench. The next season she was the leading scorer on a 27-1 team. Not a bad hoops resume for a player about to enter high school. Then there was the full court – the one Charles built in the backyard so Latta could play basketball whenever she wanted. Before the court was built during her freshman year in high school, the next closest court was 14 miles away. Latta practiced on the court four or five hours every day after school. The courts had no lights, but that didn't stop Latta. Many nights, Charles saw Ivory shooting by herself in the dark, and he would have to tell her it was time to go to bed. Her talent and steady improvement attracted every top college program in the nation. Coach Stroud received so many calls from college coaches that she changed her home phone number. Ivory never got caught up in the recruiting. She was too busy. Latta says she was tempted to go out with her friends then, but she has no regrets now. Little made sacrifices as well. Her father, Robert, had the greatest impact on her as a basketball player. During the summer and days off from school, Camille went to a nearby reaction center, where Robert worked. Camille shot by herself or played pick-up games with the boys. Robert, a former North Carolina Central University standout and Harlem Globetrotter, recognized her talent. So when she was 8, he signed her up for organized basketball and began giving her drills to work on at the recreation center. Like Latta, Little had strong family support and encouragement. Her mother, Elaine, says she’s only missed three of Camille’s games. Little met Latta when they began playing together on an AAU team in high school. As a freshman at Carver High School, Little played volleyball, which helped her jumping ability and timing for rebounding on the basketball court. And the team needed help. Before Little arrived, they won just two games in three years. Her opponents discovered her ability in her first high school game. Little made three consecutive drop-step baskets to seal the victory against the best team in the Mary Garber Tournament. 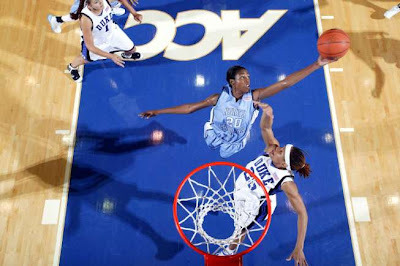 By mid-January, Little was also the defensive stopper on her team coached by Gerald Carter, whose man-to-man defense resembles UNC’s defense. Carver High lost in the state finals that year and won the title Little's sophomore year with a recored of 30-0. Carter praised Little not only for her tremendous talent, but also for her desire to become better while encouraging and helping her teammates. A team leader, Little missed just one practice during high school because of a sprained knee. Stroud felt similarly about Latta. In the state championship game her junior year against powerhouse Dreher High School, Latta scored all 33 of her points in the final three quarters to help York win its first state title 64-61. Playing for Team North Carolina, Latta and Little won a pair of AAU national titles. But more importantly they became close friends, traveling to tournaments all over the country. During recruiting visits, Latta immediately fell in love with UNC and it was close to home so her parents could come to all her games. Before the two players visited UNC, Little was leaning to go to North Carolina State University. 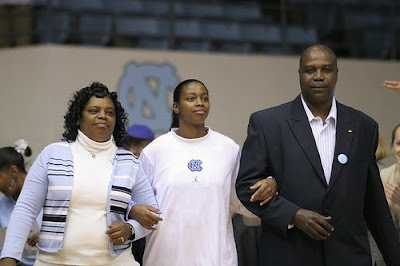 When Latta found out, she told Little that she wouldn’t go to UNC without her, and threatened to sign with Connecticut. After numerous conversations with Latta and a recruiting visit together in Chapel Hill, Little chose UNC. They both made their decision early in their senior year, the last year of two great high school careers. Latta’s stat sheet speaks for itself: 4,319 points, 570 3-pointers, two-time State Player of the Year, and the 2003 Morgan Wootten/McDonald’s National Girls’ High School Player of the Year. 470 steals, 209 assists, 260 blocks, and two-time State Player of the Year. Numbers, however, don’t say everything about this pair of precocious players, and basketball talent alone isn’t the reason they both have a day named after them in their hometowns, or the reason Latta was voted homecoming queen and Little voted prom queen. “She’s unselfish, works hard, cares about the classroom and cares about other people,” Carter said about Little. During high school, Latta woke up at 8 a.m. every Saturday and coached girls age 5 to 11 in a recreational league. She enjoyed it as much as the girls she instructed did. Latta scored 70 points in her final game at York. But what Stroud remembers most is how Latta had the opportunity for an open 3-pointer, which would have given her team 100 points. However, Latta was just as happy to pass the ball to senior Felicia Hemphill, who drained the shot in front of a usual sellout crowd. Latta and Little have become more popular in Chapel Hill since the basketball season began. Three freshmen, who had a class with Latta, wore homemade “I Love Ivory” T-shirts to the game at Duke. “She’s really nice and really humble, especially for being so good,” said Sarah Murphy, one of the three freshmen. It’s this humble attitude and eagerness to help the team improve that made the jump from high school to college less difficult than it could have been. They also credit their coaches and teammates for helping them make the transition. signs of her passion for the game. Little has that same love, but rarely cracks a smile during games. Little’s style of play is less flashy than Latta. She uses her quickness and superb instincts to score in the paint and rebound, and she has a good shooting touch on the perimeter. They are the top scorers on a nationally-ranked UNC team, yet they still have things to improve. Charles says Ivory thinks about her missed shots too much, and Carolina head coach Sylvia Hatchell says Ivory’s biggest weakness is man-to-man defense. Hatchell commends Little’s team defense, but says she may have to keep adding strength to her slender frame despite becoming stronger since high school. Little’s mother, Elaine, says her daughter is playing too unselfish. Considering she has been named the Rookie of the Week in the ACC several times this year, that’s scary news for her competition. In the first conference game, Little’s 28 points and 13 rebounds, along with 30 points by Latta, helped Carolina beat Wake Forest. And just a few days earlier they led the way in a victory over then 10th-ranked Penn State. So how do they rank among other UNC greats? Both freshmen hope to play in the WNBA after college. Latta says she loves working with children, and she might pursue a career as a pediatrician. Little says coaching might be in her future. But, for now, their primary concern is progressing so the team can win. This story first appeared in the Blue & White Magazine in February 2004.